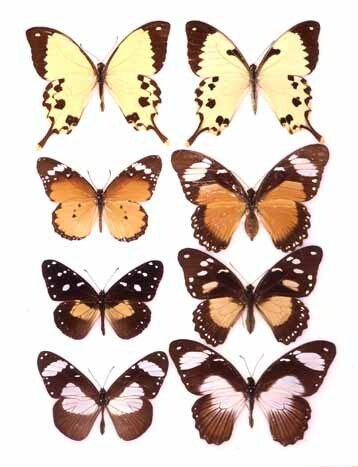 The photo shows, on the bottom three rows, unpalatable butterfly model species in the family Danaidae (left) and palatable mimetic forms of female Papilio dardanus (right), an African swallowtail species. At top left is the Papilio dardanus male; at top right is a non-mimetic, male-like female of the same species. The polymorphic, female-limited Batesian mimicry was first described by Roland Trimen (1869).